Many people think that cats are harder to understand or that they have a more laissez faire attitude than their canine counterparts, but this is not the case! The key to understanding your cat and their moods is through some subtle, and not so subtle, body language cues. Understanding your cat’s body language, will enable you to have a better relationship with your furry feline friend. We’ve all seen our cat on their back, sometimes stretched out, with their belly exposed. Our first instinct is to pet that elusive soft spot but we are afraid that our hand may be under attack. So, what does it really mean when our cat puts their tummy on display for us? Typically, when a cat is rolling around with their belly in the air it’s a good sign that they are content and happy. Their stomachs are one of their most vulnerable spots and exposing it freely means they trust you. But use caution when going to pet this area, as touching their belly triggers a defensive response due to the vital organs stored there. Take note of your cat’s reaction when you touch their belly. If they don’t like it, avoid it altogether. You know the one we’re talking about: arched back, fur stiff and stick straight up, tail stiff and curved downward. This pose can be alarming if you’ve never seen your cat do it, and there are two reasons they may act this way. The first is that they’re scared of something or someone. If this is the case this pose will often be accompanied by hissing or growling with ears folded back, and sometimes their teeth showing. When this happens, watch out as this is a sign of aggression and threat to attack. 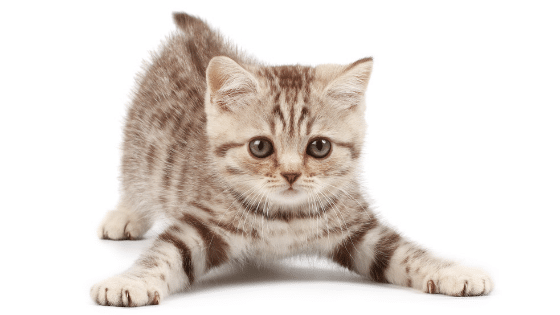 On the other hand, the Halloween cat pose can be a sign of playfulness, especially in kittens. None of the aggressive behaviors will be displayed, and the cat will usually be hopping around and going in and out of the pose. Take this as an invitation to play with your kitty! As a cat owner, if you receive slow blinks from your cat you should feel honored. These languid blinks are a sign of affection, similar to a kiss from a dog. These slow blinks are the ultimate sign of trust, as cats do not often close their eyes when in the presence of other animals. These blinks communicate that you are aware of the cat’s presence but pose no threat to it. If your cat does this to you, try returning the gesture! I do it with my cat all the time and it helps form a special bond between us. There are numerous reasons why your cat may stare at you, and those big and unblinking eyes can make you feel uncomfortable when they’re locked on you. More often than not, your cat is staring at you because they want food. I find this to be the case with my cat, especially around dinner time. She sits on the arm of the couch and stares at me until I get up to feed her. After she eats, she resumes her normal behavior. Sometimes, though, staring can be a sign of something else like fear or aggression. If you’re unsure how your cat is feeling, pay attention to their body language as a whole. If they are displaying signs like dilated pupils, ears flat, or growling and hissing, steer clear or remove whatever is causing the disturbance. Cat’s use their ears to communicate a wide variety of things both to humans and other cats. Here are some of the most common ear positions and what they can mean for your cat. Ears straight up – Your cat is alert and listening. Ears forward – Your cat is content and/or playful. Ears turned back – Your cat is irritated and/or overstimulated. Watch out! Ears sideways – Your cat is feeling anxious or on edge. Proceed with caution. Ears flat back – Your cat is feeling defensive and scared. This can also be a sign of anger and aggression. Leave your cat alone if you see this behavior. A cat’s tail is another tool used for communication. It has many different positions that all indicate a variety of emotions. Here are some of the most common tail movements and what they mean for your cat. High in the air – Your cat is feeling confident and content. This position is usually a sign of happiness and friendliness. If there’s a little twitch at the tip, they are feeling particularly happy. Question mark – Your cat is in a playful and friendly mood! Straight down – This is a signal of aggression for most cats but can depend on the breed. Some cats, such as Persians, naturally carry their tail low for no reason. Slow swishing – Your cat is focused on an object. This usually takes place right before they pounce on something. Rapid whipping – The opposite of slow swishing, this indicates your cat is feeling aggressive and probably scared. Curved beneath the body – Your cat is feeling fearful or submissive. This is often a sign that they are nervous. Puffed up and bristled – If their tail resembles a pipe cleaner or bottle brush, your cat is severely agitated and frightened. They puff up their tail to appear bigger and ward off danger.